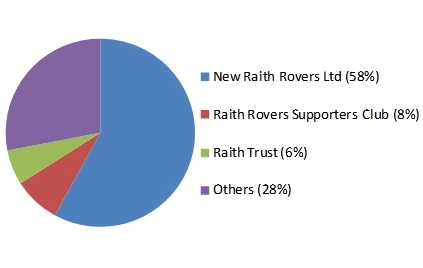 Raith Supporters Trust » Blog Archive » Raith Rovers – Who Owns What? In addition to his majority shareholding, John Sim holds the £500,000 personal guarantee to the Allied Irish Bank on which the “mortgage” is secured. 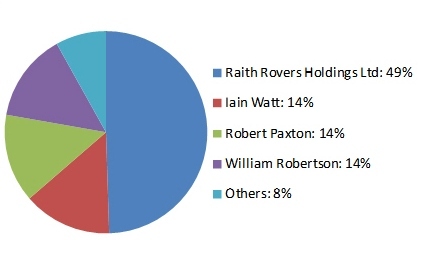 In addition to it’s shareholding of 49% of the ordinary shares, Raith Rovers Holdings also owns 56% of the preference shares in RRFC Ltd – giving it majority voting rights. It goes without saying that all of this represents an extremely complex structure! In an ideal world we might hope to see just one company in place to operate all aspects of the football club, but unfortunately this ceased to be the case a long time ago, when the club was split into RRFC Ltd and Raith Rovers Holdings Ltd; and continued with the sale of the ground to West City in the more recent past. The creation of the New Raith Rovers consortium and the resulting additional complexity in the club’s structure was a result of the speed at which we needed to move to secure the future of the club, and the reality that the resources at the consortium’s disposal were insufficient to make an offer to each and every individual shareholder in each of the companies – which would be necessary if the club were to ever collapse this structure back down to a single company. The good news is that when Dave Somerville spoke at our recent AGM, he shared our concern about the complexity of the club structure. This is definitely an issue that is on the club’s agenda as well as our own. Being concerned about it clearly is not the same thing as being able to do something about it, but it is refreshing given our recent history that the club and its supporters share the same concerns. We should also be encouraged that we have a strong position in this structure, and have been able to maintain this position in the two years that have passed since the takeover. 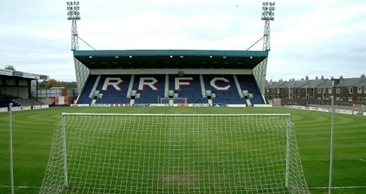 Every pound invested by the supporters’ groups in the Raith Forum serves two purposes – it purchases a share in New Raith Rovers Ltd, and it contributes to the running costs of the football club. We intend to hold more sessions like the one in December throughout the coming year. If there is a particular topic you would like to talk to us about, use the Comments area below to let us know about it. So in simple terms then……. Yeah, I wish “simple terms” existed! 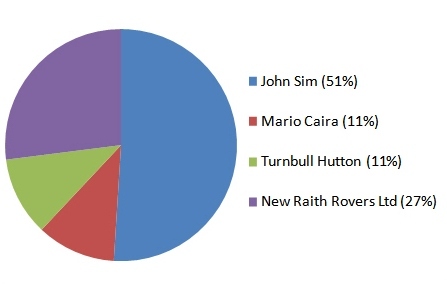 The simplest I can make it is that John Sim has firm control of Starks Park, and control of everything else is balanced in the hands of four individuals plus the Raith Forum. No single shareholder in NRR can do anything without the agreement of at least two others. RRFC Ltd and Raith Rovers Holdings Ltd are in all practical terms irrelevant, as NRR has effective control of everything at the football club apart from the stadium. Wonder if you could help. What is the value of the mortgage that the club have with Allied Irish bank? What are the monthly repayments? Is this an interest only mortgage? Also, I tried donating money to the trust via Paypal. After a while I received an e-mail from Paypal saying that the money hadn’t been claimed yet. What is the best way of donating money to the Trust and renewing membership? Re Paypal, we rebuilt the links a month or two back after someone else brought our attention to this same problem – if you tried donating before the turn of the year then it should work okay if you try again now. If it was more recent than that let me know as it’ll mean I have something else to fix now! Thanks. It would be interesting to find out. I’ll try again with the donation on Paypal…or I might just go with snail mail and send a cheque. I’ll try and do my PAYE at the same time. – West City have now been re-named “Starks Park Properties Ltd” which will hopefully allow us to release some of our emotional baggage about the old regime! – I’ve put the word mortgage in inverted commas, as this term might lead to misconceptions about how the club’s finances are structured. Commercial bank loans don’t work exactly the same way as the mortgages we take out to buy our homes, so the idea of “interest only” or “capital repayment” don’t necessarily apply in the same way. For instance, banks don’t normally request a personal guarantee in addition to the security of the land and buildings’ valuation. Finally your question about the value of the “mortgage”. According to West City’s 2005 accounts, they had an investor’s loan of £217,000 and a bank loan of £368,866 (I’d assume that this second figure is the sum owed to the Allied Irish Bank). So in total the football club’s rent was used to service debts of almost £600,000 at that point in time. These figures are obviously a couple of years out of date now, and the 2006 accounts will have been published last year. Unless there is an urgent concern about this I’ll probably wait until the 2007 accounts are published before looking for more information about this. Re the topic above. How much is owed on the ‘mortgage’ on the ground now? Not sure about the current situation – in the most recent accounts of Starks Park Properties from Companies House the bank loan is listed as £389,332, but those are for the year ending January 2010. The next set accounts are due to be filed by the end of next month. This is the loan that was renegotiated in December 2008 for a repayment term of 15 years. The ‘bank loan’ seems to have increased, as it was noted as £368,866 in 2008, but it’s £389,332 in 2011. Any idea why that is? Does the bank loan still refer to the sum owed to the Allied Irish Bank? Have the club renegotiated the terms of the loan? how much ground rental are the club paying a month as it was reported at 6000 a month ? 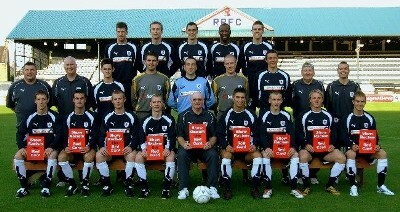 How much is the total debt of RRFC ? because we always hear these different figures being banded about. Scary Bear – I’m not 100% sure why that is, although as I said previously the loan was renegotiated in 2008 for a repayment term of 15 years – by Starks Park Properties, which is to all intents and purposes John Sim as he is the sole director of that company. Could be that some of the investor’s loan was replaced with bank loan? I’ll see if I can find out more – I’m in the process of updating the “who owns what” document, so am getting hold of all the bits and pieces that tell the story. Just checked the Starks Park Properties accounts – the club have been paying £4000 rent per month, although that has been contested by Starks Park Properties for several years. Even at that reduced rate of payments, SPP makes a healthy profit (over £100k cumulatively in the 3 years since John Sim’s removal of the other directors from the board) from it’s business, which is solely the provision of a stadium to Raith Rovers. I would question the need for SPP to even make this amount of profit at the expense of the club, never mind the additional rent it would like to charge. thanks for the info alan. 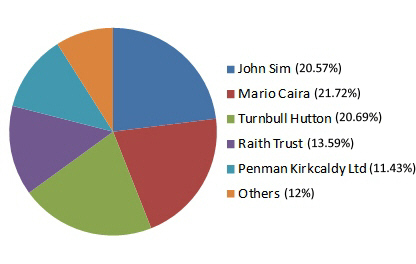 so basically john sim has made 100000 in 3 years out of the starks park rental and taking away soft loans cash inputed by benefactors we have a trading loss of 200000 and rising. Only an enquiry & I may have missed this information earlier, but where are Turnbull Huttons shares allocated. Bearing in mind the situation. Please don’t find this offensive as it’s not meant in that manner. Gerry, on the last annual return Turnbull’s shares were still listed in his name. I guess this will change before too long but I don’t know the details of his estate.